This customization option will make a tablet show your own boot image and wall paper. 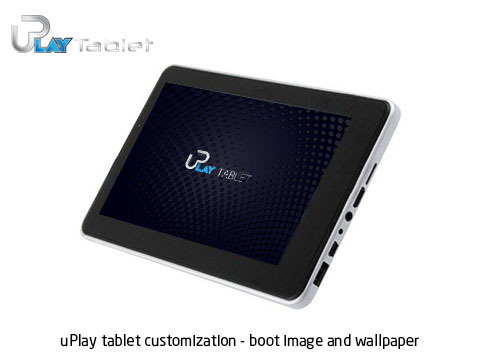 uPlay tablet will create a customized firmware to use your own image for boot image and wall paper. The boot image is the image that will be shown at tablet boot-up. The wall paper is the background image of tablet home page. This will allow your users to see your company’s logo or marketing message when they are using your tablets. Category: uPlay Tablet Customization. Tag: uPlay tablet customization - boot image and wall paper. uPlay tablet will create a customized firmware to use your own image for boot image and wall paper. The boot image is the image that will be shown at tablet boot-up. The wall paper is the background image of tablet home page. This will allow your users to see your company’s logo or marketing message when they are using your tablets . No extra charge if you order multiple tablets in a single order. We will install this customized firmware on each of the tablet you order. You need to pick a tablet from our store if you buy this tablet customization option. You can pick any tablet we carry. Just keep in mind if you also want to print logos on the tablet (one of another customization package from us), then you have to pick from “ custom built tablet ”, not Ainol tablets . You also need to send your boot image and wall paper after you place the order, so that we can use them. Just email those files to info at uplaytablet.com (assuming you are human, so you know to replace at with “@”). You can find the tablet screen resolution in the tablet spec. For example, if the screen resolution is 800×480, then the recommended boot image size would be 800×480, and the wall paper size would be 1600×960. Keep in mind, only the center area of the wall paper will be shown on the main home page, the rest of the image will be shown when user tap to the left and right. So, if you want to display your company logo on the wall page, you better put it in the center area, not larger than the tablet screen resolution. The turn-around time for this task bar manager customization is 2 days from the day that we receive app. This is perfect if you want to use tablet for your marketing purpose. Once you are happy with the tablet and the customization, we can talk about the price of volume production. In general you can expect 10~20% discount on top of the sample price when you order it in volume. We have 5 factories with 500,000 tablet capacity per month, so we can definitely meet your volume production requirements.